The Fayette County All-N-One 4-H Club presented awards to their 2016 members that did an excellent job in their projects on Feb. 7. Front row: Katy Kotlinski and Skylynn Barden. Back row: Hidy Kirkpatrick, Madison Johnson and Thomas May. Absent were: Lorelei King, Kayla Miller, Victoria Miller, Taylor Perkins, Bethany Reiterman, and Andrea Robinson. 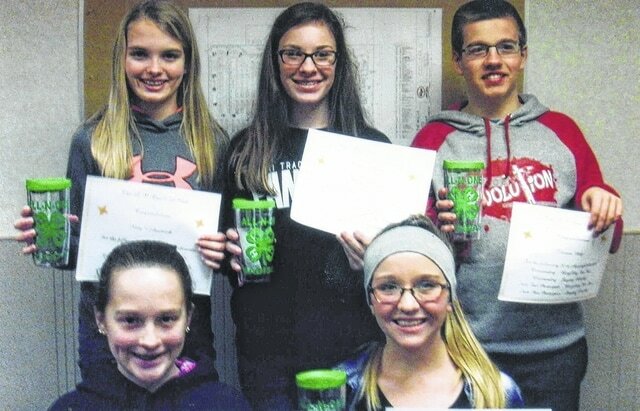 The Fayette County All-N-One 4-H Club presented awards to their 2016 members that did an excellent job in their projects on Feb. 7. Winners were Katy Kotlinski, Skylynn Barden, Hidy Kirkpatrick, Madison Johnson, Thomas May, Lorelei King, Kayla Miller, Victoria Miller, Taylor Perkins, Bethany Reiterman, and Andrea Robinson. Katy Kotlinski, Environmental Office, Best of the Best. Skylynn Barden, Fayette County Horse Queen and High Point 15 and Over. Hidy Kirkpatrick, Junior Superintendent, Outstanding; Sports Nutrition 1: On Your Mark!, Outstanding of Day; Clothes For Middle School, State Fair Participate; Sports Nutrition 1: On Your Mark! ; Top Junior Models, 4-H Style Review and Treasurer Office, Best of the Best. Madison Johnson, Horse Overall Showman, second place; Junior Superintendent; Secretary Office, Best of the Best and State Fair Participate (Horse). Thomas May, Outstanding, Bicycling for Fun; Outstanding, Staying Healthy, State Fair Participate, Bicycling for Fun; State Fair Participate, Staying Healthy. Kayla Miller, Community Service, Best of the Best; Junior Fair Board Member and State Fair Participate, You’re the Chef. Victoria Miller, Health Office, Best of the Best; Junior Fair Board Member; Outstanding, Alcohol and Drug Abuse, State Fair Participate, and State Fair Participate, Diversity: The Source of Our Strength. Taylor Perkins, Senior Versatility Winner and Vice President Office, Outstanding. Bethany Reiterman, Camp Counselor; Fayette County Fair Queen; Horse Committee Member; Horse Overall Showman Winner; Junior Fair Board Member; Outstanding 4-Her Award; President Office, Best of the Best; State Achievement Award Winner, Horse first Alternate; State Jr Fair Board Member; Swine, fourth Overall Championship; Division Winner Pig; four year Camp Counselor Award; four year Jr Fairboard Member Award and fourth Place Overall in Showman of Showman. Andrea Robinson, High Point 14 and Under; Junior Fair Board Member; Junior Versatility Winner; News Reporter Office, Best of the Best and State Fair Participate (Horse). https://www.recordherald.com/wp-content/uploads/sites/27/2017/02/web1_img531.jpgThe Fayette County All-N-One 4-H Club presented awards to their 2016 members that did an excellent job in their projects on Feb. 7. Front row: Katy Kotlinski and Skylynn Barden. Back row: Hidy Kirkpatrick, Madison Johnson and Thomas May. Absent were: Lorelei King, Kayla Miller, Victoria Miller, Taylor Perkins, Bethany Reiterman, and Andrea Robinson.